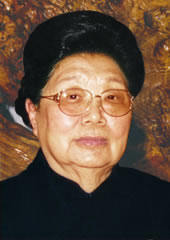 Qian Ren (Senior Elder) Ms. Chen, given name Hong-Zhen was born in the city of Tianjin in 1923. She was very pious since childhood and born with great wisdom. Ms. Chen was deeply loved by her parents just like the most precious pearl. At the age of 14, she imitated Guan-Yin Bodhisattva and vowed to stay single all her life. She received Tao at the age of 18 and realized Tao is the Way to save the suffering world, and Tao is the source and transcends the 5 world religions (Taoism, Confucianism, Buddhism, Biblicalism, Islam). Ms. Chen vowed to practice and propagate Tao and forsake all earthly attachments. In 1947, she vowed to start a mission to Taiwan and had to return home shortly because of sickness. On the journey back she encountered heavenly revelation. The next year she accompanied Lao Qian Ren back to Formosa to propagate Tao. Ms. Chen spread Tao like farmers working on desert fields. After countless hard work, misunderstandings, and tests from the public, tribulations from the governments and most of all the testing of her will and determination from Heaven; Qian Ren was able to overcome all the hindrances. With her great mercy, compassion and charitable ways, Tao propagation started from Yunlin and spread to Zhanghua, Taipei, Taichung, Miaoli, Kaohsiung, and Tainan. After more than 20 years Tao was spread all over Taiwan; hence propagation abroad started, form Japan, South East Asia, and America..., now Tao propagation is in more than 20 different countries under Qian Ren's leadership and cultivators are all over the world. Qian Ren possesses the heart of Heaven, the aspiration of Shi-Zun and spreads the virtues of Han Lao Qian Ren. For more than 10 years she has propagated Tao and hosted charitable events with the 5 cultural and educational foundations. Qian Ren also established centers for elderly and orphans. For all the charitable events and activities, Qian Ren constantly received numerous praises and awards from governments and public. Under Qian Ren's sagacious leadership, there are 20 major Tao societies in the world. The five-year cultivating courses have nurtured tens of thousands of model citizens each year, and everyone is working toward the goal of Maitreya utopia. For more than 50 years, Qian Ren propagated Tao tirelessly and modeled herself after Tao. Acknowledged by the Almighty, Qian Ren was honored with the Heavenly Decree to continue the works of our Shi-Zun, Shi-Mu and Lao Qian Ren to salvage the suffering world. With thankful hearts, all the cultivators are honored and will follow Qian Ren's leadership to help accomplish this sacred mission.